Quicklink: More Ado About Lucas? 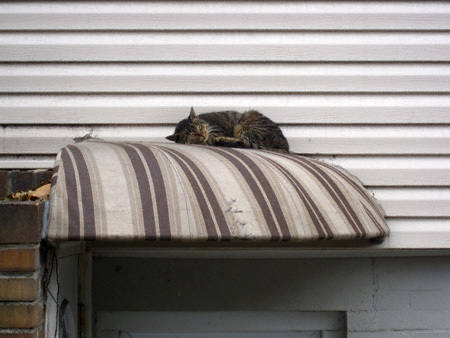 I caught this handsome (and rather rugged chap) sneaking a little shut-eye on Humboldt Street awning yesterday afternoon. On that note (that being the other kind of catnapping) it would appear the tale of Lucas’s disappearance has found its way to the Brooklyn Paper. Not only is yours truly cited (imagine that) but apparently the guys at Pets on the Run are offering a $200 reward for the return of their beloved feline. You can read the whole sad story by clicking here.